So after having done some preparatory work on annuities in Annuities I and Annuities II , now let’s do a few scenarios with and without annuities. (There is also the Annuities IV blog the last in this series of four on annuities.) This blog is not the definitive but rather more like an introduction to annuities. Annuities considered are SPIA (Single Payment Immediate Annuities) and SPDA (Single Payment Deferred Annuities). The annuities may be indexed or un-indexed for inflation; there was no difference on Probability of Success (i.e. not running out of assets before the end of the plan period) with fully indexed immediate annuities, likely since when indexed the initial annuity payments are about a third lower than the un-indexed ones. The scenarios were assessed using Jim Richmond’s Monte Carlo simulation tool flexibleRetirementPlanner discussed earlier. Of course, when studying the results, you must remember Richard Hamming’s admonition that “The purpose of computing is insight, not numbers”. The scenarios assume that a 60 year old has $1,000,000 assets with a 40 year horizon (i.e. to age 100), with a desire to spend either $40,000 or $50,000 per year indexed with inflation (Spending Policy = Stable, as defined by planner and average inflation of 3% assumed). The portfolios considered, using the tool defaults, were: Below Average Risk (Average Return = 7.5%, Standard Deviation = 7.1%), Moderate Risk (Average Return = 8.5%, S.D. = 9.9%) and Above Average Risk (Average Return = 10.0%, S.D. = 14.3%). Tax rates of 15% for investment and 20% for income were used. The taxable percent of annuities were assumed to be 50%. In instances where annuities were used, the amount annuitized was $150,000 of the original $1,000,000 assets. Either of two types of annuities was assumed to be purchasable for the $150,000: annual $10,500 (un-indexed) fixed immediate annuity or $120,000 annual (un-indexed) fixed deferred annuity with payments starting at age 85; remember that if individual dies before age 85 the annuity results in no payments to the beneficiaries. The following table summarizes the results. You will note that an inflation adjusted spend-rate of $50,000 results in relatively low probability of success at all three levels of assumed portfolio risk. This is not too surprising a result, since for a 40 year horizon, the literature recommends a Sustainable Withdrawal Rate of 3.3% to 4.0% depending on portfolio risk assumptions and even more depending on the spending policies used; here the spending is fully indexed, rather than making allowances for reduced spending during years of poor returns. For the $40,000 inflation adjusted spend-rate, there is little difference between the no annuity and SPIA or the immediate annuity in terms of probability of Success (defined as not running out of money until age 100). However when a deferred annuity is used, the probability of success increases significantly. 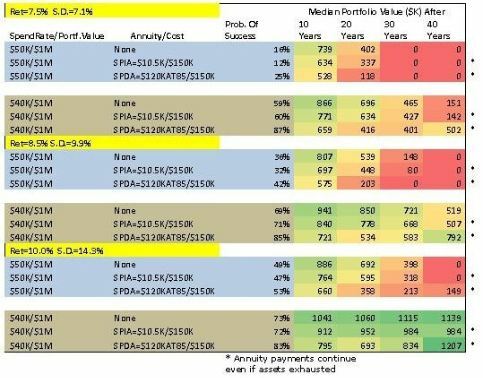 By studying the results one can quickly conclude that annuitizing 15% ($150,000) of total assets using a fixed immediate annuity (SPIA) without inflation adjustment, at the indicated annuity pricing available from the market, results in similar ‘Probabilities of Success’ at age 100 and though slightly lower ‘Median Portfolio Values’ at ages 70, 80 and 90 but comparable at 100 when compared with the un-annuitized case. On the other hand if we use the $150,000 to buy an un-indexed fixed annuity deferred to age 85 (SPDA), it appears that the annual annuity payment available is about $120,000 starting at age 85. In this case the ‘Probability of Success’ increases by 11-27% for the $40,000 and 6-13% for the $50,000 annual spending cases. Also, note that even when the assets run out, there are quite substantial annuity payments that start at 85 and continue until death! Of course there is a trade-off. If death occurs prior to age 80 the ‘Median Portfolio Value’ will be about $300,000 lower (due to having paid $150,000 for the annuity and not receiving any annuity payments). However should investor live past 85-90, in the $40,000 spending scenarios the ‘Median Portfolio Value’ starts increasing, resulting in a higher estate value even though funds were spent on annuitization. Works just like longevity insurance is supposed to work. Again, if you think about this, the outcome is not that surprising. If you annuitize at age 60 via an SPIA, an immediate annuity, your mortality credits will be minimal. However if you annuitize via an SPDA, a deferred annuity to age 85, you may be getting significant mortality credits (if you live long enough to collect). But then, if one dies young there will still likely be assets left for the estate and the 15% annuitized won’t be missed. Whereas if one lives to a ripe old age of 90-100, the annuity payments will help you sleep better at night and your estate may even start growing again. Clearly, deferred annuitization is not the recommended answer in all cases, but for instances where investor expects greater than average longevity, especially as more competition kicks in for better pricing of these annuities, it is an option that is worth looking at. But then so are many other options that we didn’t look at here, like phased commitment of intended assets for annuitization somewhere between 75 and 85, where the mortality credits overcome annual expenses incurred as a result of annuitization. You can explore the scenarios of interest to you using the Monte Carlo tool flexibleretirementplanner.com , but this is a fairly complex area, so you’ll probably want do it with your advisor.